The AR linked above (didn’t upload that one myself) has also been translated with Google Translate. It’s not perfect, but you get something that is understandable. Nice! What broker do you use? And what’s the comission? Also, do you know of the rate regarding witholding tax on dividends? Cheap as chips these stocks. Do you have any idea how I can circumvent the page limit on google translate when translating large pdfs? That would help a great deal when looking at cheap japanese stocks. I just dont feel complete without fully reading an annual report before investing. Use EDINET to download the AR in XBRL format and you get a zip file with a dozen html-pages that you can open in Google Chrome to translate it automatically. Thank you for sharing this information about Fujimak. Did anyone notice that there are two quarters in a row of heavy losses. There appears to be a problem with the pension funds. 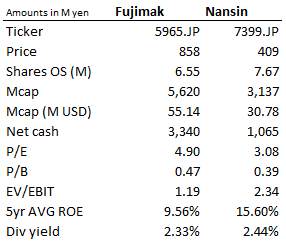 I am not sure if this will change much about the overall fundamentals at Fujimak. Today, I received a dividend payment of 30 yen per share, which is more than previously announced (http://www.reuters.com/finance/stocks/5965.T/key-developments/article/3198815). Does anyone know, why the dividend has been raised in the annual shareholder meeting? I haven’t received a dividend yet, and I have a 20 yen per share dividend accrual. Payment date is tomorrow I think, so we’ll see if they did indeed raise the dividend.